This is a breakdown and review of the Sony HDR-AZ1. This review aims to take you through the details of all features, pricing, and use for this great little camera, including how it compares to similar products on the market. If you’re shopping for a new mini-cam for yourself or an adventurous family-member or friend, here’s everything you need to know about the Sony HDR-AZ1 and a few other noteworthy options. What Is the Sony HDR-AZ1? The Sony HDR-AZ1 is a mountable video camera that can be categorized as a more basic, stripped-down version of Sony’s top point-of-view camera, the Action Cam HDR-AS100V. In many ways, Sony’s endeavor to streamline usability has made the HDR-AZ1 the preferable model of the two. Shedding certain extra features has allowed this camera to be more compact while increasing versatility. The camcorder has no video or audio jack, the screen is small and only shows battery-life, SD card status, and Wi-Fi connectivity, and the only buttons are On/Off, Wi-Fi controls, and Record. All of this might sound like a lot of compromising, but there is a clear benefit. This minimizing of physical features has allowed the Sony HDR-AZ1 to be one of the most compact on the market, making it great for mounting, tracking, tight spaces, and interesting angles. While certain features were cast away, Sony kept the integral ones that make for a great video camera. The Sony HDR-AZ1 has a Zeiss Tessar f2.8 lens with a 170-degree field of view, high-bitrate XAVC-S-format video, electronic image stabilization, a dual-format card slot, and wireless features accessible with either the Live-View Remote or an assisted Apple or Android device. The camera can record in MP4 or XAVC-S format, which has a bitrate of 50Mbps. In MP4, there are several options: 1080p at 60fps or 30fps; 720p at 30fps or 120fps; and 480p at 30fps. The high-speed slow-motion option comes in at 720p at 120fps, but higher quality is offered by the XAVC-S format with full HD at either 60, 30, or 24fps. Color settings for the HDR-AZ1 allow for Vivid, Neutral, or Underwater. The battery is small and rechargeable, with a life around an hour and a half depending on bitrate and Wi-Fi usage, which means extras will likely be needed for full days of shooting; but the battery won't weigh the camera down when it's mounted onto something like a skateboard or bike. All of these features are packed into a body that is only 24.2mm (0.95 inch) x 36mm (1.4 inches) x 76mm (3 inches) and weighs 2.2 ounces. The small size and quality recording capabilities make the Sony HDR AZ1 a versatile little device. 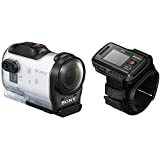 The best place to purchase the Sony Action Cam Mini HDR-AZ1 is on Amazon for around $200-$300. Purchasing the camera as a bundle is probably going to add about $100 to the overall price, but, in addition to the micro-USB, battery, waterproof housing, and tripod mount, you’ll get the Live-View Remote that can easily strap around your wrist and give you full control and viewing capabilities of 5 Action Cams at once, as well as providing GPS for location of photos and videos taken on the go. The price is fair in the field of action and POV cameras and puts it in the low-to-mid range without a drop in end-product quality. We picked a few similar products available on the market to see how they compare to the Sony HDR AZ1 across a few categories. The listed price is around $250, subject to market variability, which puts this on the mid-lower range of the price spectrum. For what it is, the HDR AZ1 is easy-to-use. There are not a lot of controls, but it is primarily purposed for situations in which the user is away from the camera. This also means that there isn’t as much to figure out or adjust before capturing your footage. There is extremely high-quality video packed into this tiny camera. It has the same codec and bitrate options of a much larger camera, maintains a 1/ 2.3” CMOS sensor, and has built-in image stabilization. This camera does not zoom and does not have the ability to adjust things like aperture and focus. There is a lot to be said about stripping away features for the sake of size. That gives this camera an edge in capturing more novelty shots. But there was a clear balance in place on the design-end for this product in maintaining quality. Many users are accustomed to having more manual controls and features, but the HDR AZ1 rides the line of usability and quality as a tiny action cam. The warranty is a standard one-year that covers manufacturing defects. The calling features of this camcorder are its lightweight stature (8.5 ounces), durability, high-quality recording (MP4 1080/60p), Touch Panel LCD, and video-assist features such as Highlight Priority and Zoom Framing Assist. It is not considered a POV or Action Cam. Amazon has this listed at around $200, subject to market variability, making this on the cheaper side of the spectrum. This camera is designed to appeal to those who are maybe new to the camera game. There are features in the camcorder that assist the user with things such as zoom and exposure without getting into manual settings. The touch-screen definitely improves ease-of-use. With a Full HD CMOS Sensor, DIGIC DV 4 Image Processor, and 57x Advanced Zoom, the video quality of this camcorder is great for the package and price. This camcorder gives its user a lot of options, but for its size, it doesn’t fit in more features than others comparable, or even smaller. This camcorder is larger: 5 x 2.4 x 2.4 inches and 9.3 ounces, but it has more features for sure. It records in Full HD 1080p and has the same intelligent zoom feature as the Canon, with 50x zoom. It has 5-axis Hybrid Optical Image Stabilization, which is on-par with others in its field. This camera does have Wi-Fi enabled, so remote viewing and feature-control is possible. It is listed around $350, subject to market variability. All of the settings and features on this camera are pretty straightforward, making it easy to use in your basic recording situations. In normal conditions, the video quality is good. It records in 1080p. The imaging sensor isn’t particularly large (which is normal with the smaller camcorders), making low-light situations a little testy. The zoom on this camcorder is effective, although the mid-range zoom has been known to give lackluster results. There is nothing awe-inspiring about this camera. It is rather average in size, average to use, and has certain minor design flaws that can impede certain kinds of usage. The biggest one for customers is that the LCD screen only rotates to a 90-degree angle instead of being able to fold open against the camcorder. This camcorder has all of the features one could want for this type of product. It’s highest recording format is the 4K XAVC-S, but gives you options for MP4 and AVCHD and the Exmor R Sensor, which is large enough for good quality in low-light. The Zeiss lens gives you 20x optical zoom and 30x zoom in 4K. Its 3” LCD screen is a touch screen, it has Wi-Fi capabilities, a manual ring, built-in zoom mic, night-shot, and time-lapse capture setting. This is on the high-end for camcorders with a price range of $700-$800. Intuitive use for beginners, with some more advanced user-controls for those who know a little bit more, this camera is going to give excellent results to anyone holding it. Many of the features are working without user-control, but there are options for some manual adjustments. The image sensor used in this device is larger than other cameras of similar size and scale, which means greater sensitivity and less noise. Recording options in 4K/24p/30p and Full HD 60p/30p and the XAVC S3, AVCHD, and MP4 codecs allow for user-control over the end product, but don’t compromise on quality. You’re getting what you pay for with this product. It has nearly every feature you could hope for, with the options to add mics and mounts. It is a higher-level camcorder, and as such, could have more potential manual controls. Out of the compared cameras, we’re giving the Sony HDR-AZ1 mini cam a solid 4 out of 5 stars. Price is important to keep in mind, as the range discussed in this article was fairly wide. The other cameras had more user controls, but really can’t be used in a lot of the on-the-go and action shots for which the Sony HDR-AZ1 comes in handy. For its size, it really is a thoughtfully designed piece of equipment with a lot of options for external features that you won’t find with basic camcorders (such as the different kind of mounts and waterproof casing). It is only two ounces, so can easily be strapped to nearly anything with minimal effect. Its sensor allows it to get even better image quality in certain situations than some of its larger counterparts in a similar price range. Really, there is a lot to be said for the features packed into this tiny camera and the effort that went into compromising things like zoom for the sake of dexterity. That gives the Sony HDR-AZ1 an edge in capturing more novelty shots, which is primarily what an action cam is purposed for. But there was a clear balance in place for this product in maintaining quality. There is no compromise on video resolution, which means the shots will always be usable, controlling for user-error. There are also just so many interesting captures that can be accomplished with the remote-view and control, whether that is with the app or the remote wrist-strap. While not ideal for basic recording, such as a child’s soccer game, it is perfect for novelty recording situations. 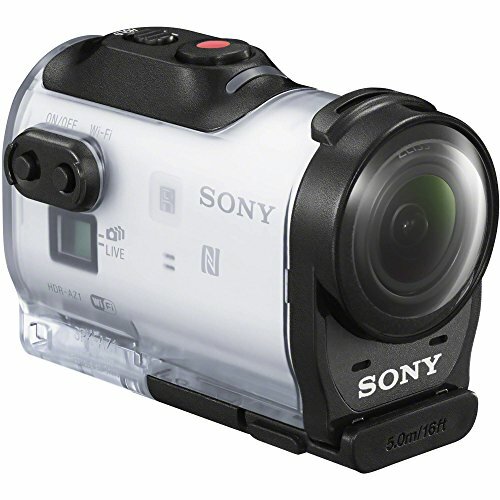 The Sony HDR-AZ1 rides the line of usability and quality as a tiny action cam with great video.